After years of waiting, Creative has finally updated the Aurvana In-Ear series with the In-Ear2. The original In-Ear wasn't exactly very well received with its high price point and its lack of bass. Not to mention that it had a relatively dull design. The Aurvana In-Ear2 on the other hand, looks surprisingly bold for a Creative earphones. Performance wise, Creative seems to have addressed the bass issue with a new grille design at the back of both buds. We also like the set of accessories that comes with it. The Aurvana In-Ear2 will retail at SGD$149 (online or at the IT Show) and £89.99 in the UK. If you are thinking "Hey, where have I seen these buds! ", you are probably not alone! 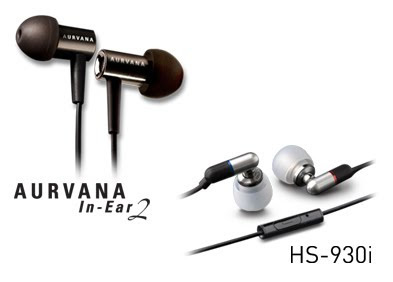 Originally known as the Aurvana Ice (or earphones with really small drivers), it is now re-branded as the HS-930i headset. These headsets are designed specially for the iPhone with full music playback controls. But it will most probably work with any phones with the 3.5mm auido jack. With more and more people using their handphones as an MP3 player, it might not be such a bad idea to invest in a good pair of headset for the phone. And with the millions of iPhones Apple is selling, the HS-930i would definitely appeal to some Apple fan boys. The HS-930i retails at SGD$149 (online and at the IT Show) and £89.99 in the UK.